Info "You'll land softly if you catch a balloon." Balloonatic is one of Dr. Crygor's microgames in WarioWare: Twisted! Its name is a portmanteau of "balloon" and "lunatic". 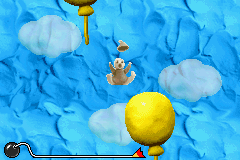 The game's purpose is to make the bear land on a balloon. If done so, the game is won. However, if it falls, the player loses the game. 1st level difficulty: Four balloons are right below the bear, two scattered balloons, or only one balloon. 2nd level difficulty: Six balloons (three are on the side of a screen), two scattered balloons, or only one balloon. 3rd level difficulty: A row of three balloons, four scattered balloons, or only one balloon. This page was last edited on September 26, 2018, at 23:29.